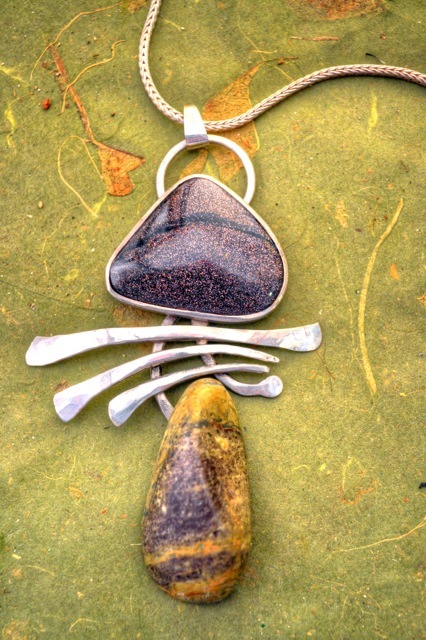 Resin Inlay with sand and beach pebbles. The origins of Kundalini Series began in Vanessa’s senior year at The Maine College of Art and Design as a fun series of pins to sell at their annual Holiday Craft Sale. It was a big hit and still inspires her 20+ years later! Each element of the design is supported by a centralized vertical axis like a human spine. Each design element represent the 7 power centers found in the human body according to ancient maps of our physiological structure. This finial refinement to the original design concept has allowed for variences in its hand forged elements, natural stone and inlay give each pendant its One-of-a-Kind appeal. Each work has been tested and charged with positive energy by a certified nanoscience engineer. You can checkout her etsy shop to buy this pendant or more like it. 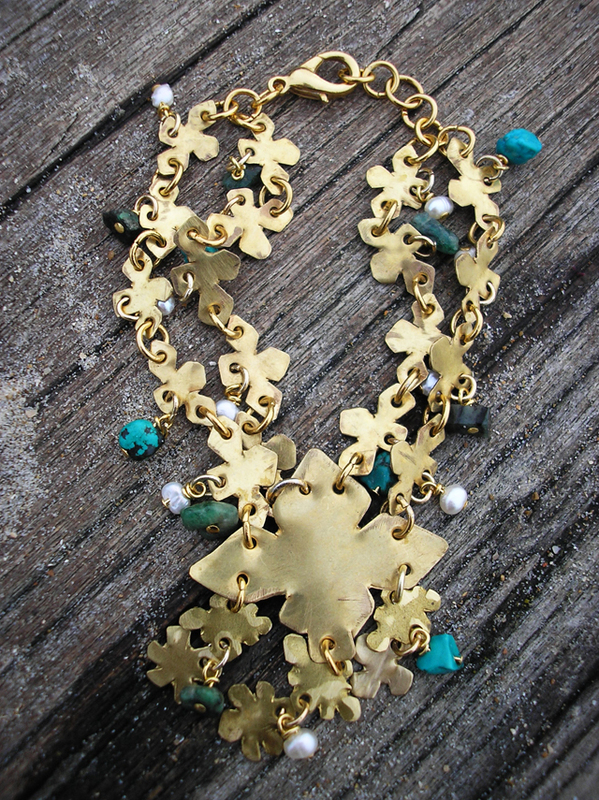 This bracelet is from my Flower Power range, it has handcut brass flowers, turquoise and emerald chip beads and freshwater pearls. It is the first time I have used emerald and turquoise together and I love it! 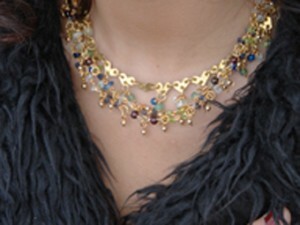 I have a necklace and earrings with this combination,look out for later posts. I am also planning to make a gold ring with emerald,turquoise and pearls! 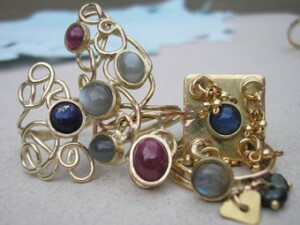 Lots of gold rings, starting from the left: 9ct gold and lapis lazuli stone ring, 9ct gold, ruby and black moonstone stone ring, 9ct gold square ring with a lapis lazuli stone and gold beads, 9ct gols ring with a labradorite stone, black pearl beads and a handcut brass heart. 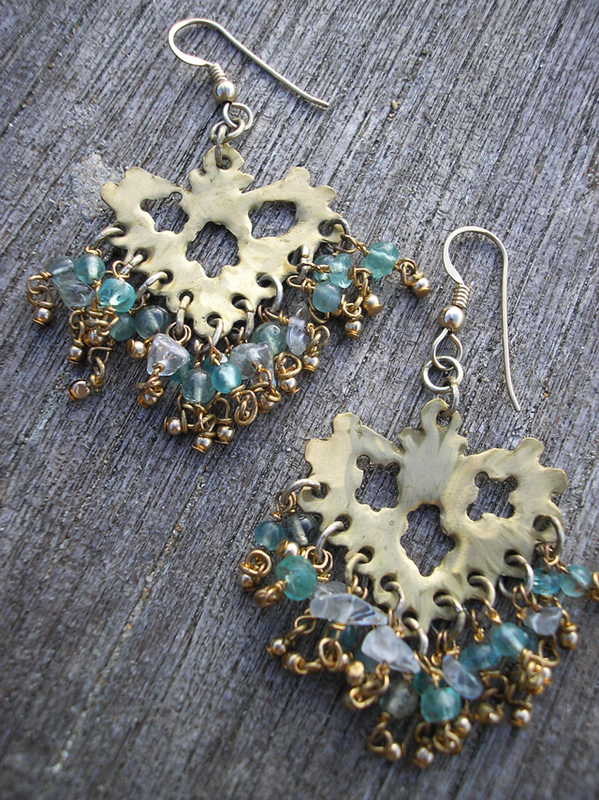 I have handcut these brass earrings and then used aquamarine,topaz and kyanite beads and gold plated beads. 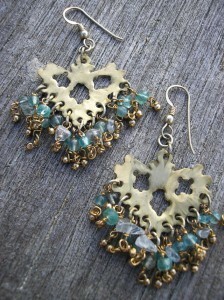 Gold and blue aways looks dramatic together and these earrings are very summery. You can check this out and more of my jewelry at my web-shop.